Nothing says summer like ICE CREAM!! 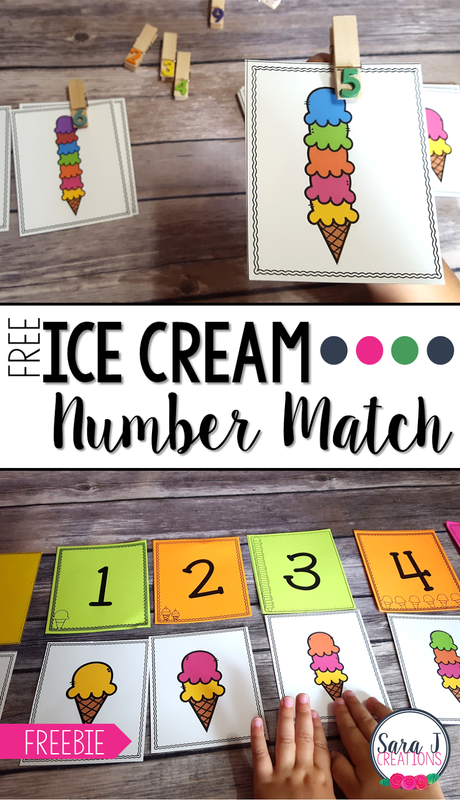 I made a number match game with an ice cream theme for my girls so we could practice numbers 1-10. I wanted to use some cute number clothespins that I found at Target, but those are completely optional. I like that they add an extra level of fine motor practice, plus justifies my Dollar Spot Purchases! Keep reading to find out how we used this game and grab your free copy. I started my three year old out with just matching the numbers to start. I printed multiples of each number and had her put them into piles by number. Meanwhile, her sister was working on counting the ice cream scoops and then clipping them with the correct number. If you want to use mini clips like this, but can't find them at Target, you could make your own with clothespins and then number stickers (foam stickers would be cute). She practiced counting each scoop and then looked at the stack she had already sorted by number to put them with the matching clothespin clip. I printed off multiples of each picture so that there was more than one of each number to give her a little more challenge. When she was all finished, she stacked and clipped each set by number. Then we combined what they had both been working on. We set the number cards out in order. Then they had to count the scoops together and sort them under the correct number. We had so much fun without the drippy mess of ice cream!! Would you like a free set of these number and ice cream cards? I've got a set just for you! Click the download button below, enter your information and then they will be emailed directly to you!